Yoga is about the art of living. To be able to rest in yourself and have balance in life: balance between activity and rest, between tension and relaxation, between the external and the internal. Yoga is also about being able to return to that balance, should it momentarily disappear or for a time be forgotten altogether. Part of what is used in this work is, among other things, the postures of yoga, the asanas. Here, we sketch out an essential feature about the use of the postures of yoga. In other articles we go into details about the single poses and programmes. 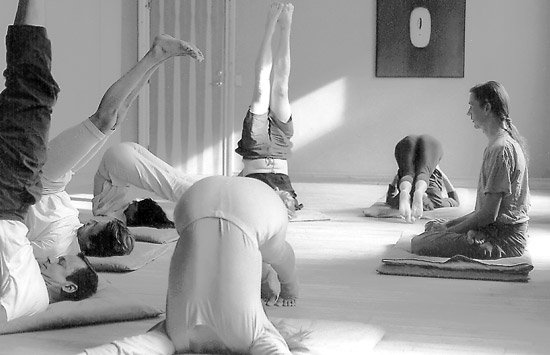 Asanas are often viewed as a form of gymnastics. But in contrast to gymnastics, where the movements are paramount and not always carried out quite consciously, the yoga postures are performed under great tranquillity and with full awareness. They are not called exercises, but postures. They are based upon a fundamental knowledge of how the body functions – in itself, and in the relationship with the mind and the psychic energy. Asana means a correctly performed, stable and comfortable pose, developed, tried and tested and passed on from teacher to pupil for generations. The asanas influence the body in various ways depending upon which pose you are in: muscles, organs, blood circulation, nervous system, glands and the breath – see for example the articles on headstand – and – shoulderstand. Here, we shall focus on the fact that while we calmly and quietly hold a muscle stretched in a yoga pose, its tensions are lowered more and more the longer we hold the stretch – the muscle relaxes. This can be ascertained by measuring the muscle tension on a person who is in a posture. Therefore, one stands or sits completely still for several minutes in each asana, and with a combination of various poses one literally touches all the muscles in the body. 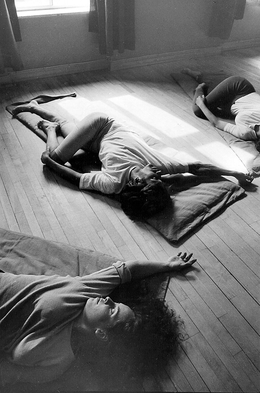 The asanas give an immediate experience of well-being and, in the long term, good health; and make the mind concentrated – the postures, however, have a further purpose: They deepen your state, which is a precondition to really understand and carry out the yogic breathing Exercises – Pranayama in the proper way – and in that way really get something out of them. It further prepares for the meditative state.